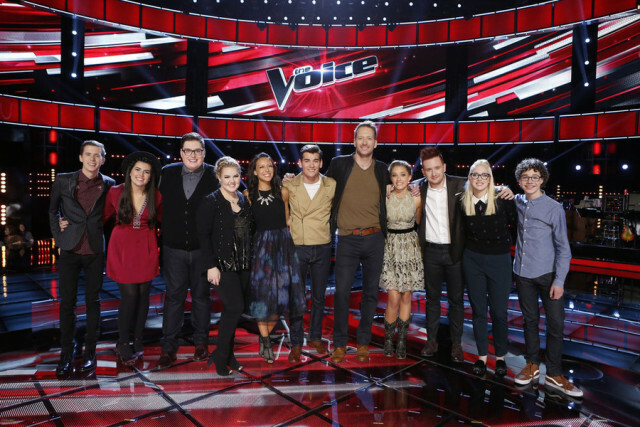 Home » “The Voice: Season Nine” Top 11 take the stage! It seems that we are always talking about the coaches instead of the contestants when we reach the live portion of The Voice. The tabloids keep having a field day as news stories of Gwen Stefani and Blake Shelton’s romance, Pharrell’s black eye and the supposed backstage tension between Gwen and The Queen of The Voice (and my favorite coach), Christina Aguilera, on who gets the Season 11 chair, have lit up the Internet. In my humble opinion, Mark Burnett, Carson Daly and the rest of The Voice Powers-That-Be should have both Gwen and Xtina on the same season with Adam and Blake (Sorry, Pharrell needs a season off). It could also lead to an epic confrontation like The Voice Australia’s Delta Goodrem and Jessie J had during the fourth season of the Australia spin-off. Anyway, back to the Top 11! I have covered and reviewed singing competitions for three years and one performance that I will always remember is Jillian Jensen’s cover of Jessie J’s “Who You Are” that she performed during the X Factor USA’s sophomore season. I sympathized with her as it brought back painful memories of being bullied when I was growing up in school. Hearing her showcase her soul with that song and receiving a hug from her hero and former X Factor USA judge Demi Lovato will always be forever engrained in my head. Tomorrow night, Team Blake advisor Brad Paisley take the stage! Question: Would you watch a season with Christina and Gwen together as coaches? Or are you Team Christina? Or Team Gwen when it comes to the supposed backstage drama involving the fourth chair? Video from “The Voice Australia” belongs to 9 Network. Jillian Jensen’s “X Factor USA” audition and Jess Meuse’s “You and I” are properties of FOX, Syco Entertainment, 19 Entertainment and FremantleMedia North America.